Trucks Lifts available help get your truck from mild to wild! We sell and install your choice of a HUGE SELECTION of lifts to enhance your ride! We also install custom suspension components! Suspension Lifts for serious fun! And many other top brands available! 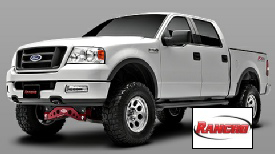 Get rid of that “Hot Rod” rake and have us level your truck by lifting the front to match the rear. Still the cheapest way to add up to 3” lift to easily clear larger tires.